This week, the Foreign Affairs Committee held a panel discussion in Parliament to mark the 40th anniversary of the Egypt-Israel peace treaty. 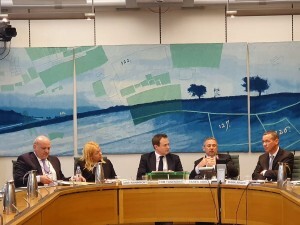 The event was chaired by Tom Tugendhat MBE MP, Chair of the Foreign Affairs Committee, and speakers included H.E. Mark Regev, Israel’s Ambassador to the UK, H.E. Tarek Adel Egypt’s Ambassador to the UK, and Jane Kinninmont, Head of Programmes at The Elders. Jordan’s Ambassador to the UK, H.E. Omar Al-Nahar, was also present. The speakers discussed the pressures that this treaty has faced and why it continues to hold to this day, why similar treaties have not been successful and what other countries can learn from this success. Israeli Ambassador Regev said that the treaty was a “profound moment for the people of Israel” and “an example of what can be done and what is possible”. Egyptian Ambassador Adel said that the treaty “laid the foundation of a new reality in the region”, and underlined that today Egypt and Israel must “renew our dedication to pursue a peace for the region”.